When it came time to decide what service project Colorado-based Girl Scout Troop 3010 would do to earn their Junior Bronze Award, the choice was clear: They wanted to make activity kits for children in need. Two questions dominated the girls’ conversations: Who do we help and who can help donate the items for the kits? The girls quickly found children who lived just 5 ½ hours away on Pine Ridge Indian Reservation in South Dakota – they knew they wanted to help them. Friends of Pine Ridge connected the troop with Wounded Knee District School, and after learning that the school has 189 students in their care, the Girl Scouts made a list of all the items to be included in 3 types of kits: Arts & crafts, wood tinker kits and robotics kits. The list was long and plentiful! The girls knew they needed financial support to make this happen – so they turned to Kids First! We were thrilled to help. Kids First decided to not only support the purchase of robotics equipment for the 7th and 8th graders through a grant, but to also roll up our sleeves and pitch in to help deliver the supplies. 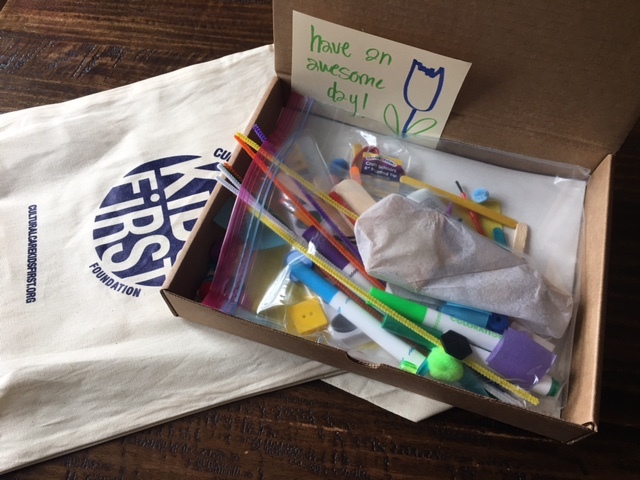 During a spring work weekend in the Cultural Care Au Pair Denver office, LCCs and staff – motivated by the story of children who lived so close but have so little – jumped in to assemble 110 arts & crafts kits. Then, the generosity kept coming. Soon, local au pair and host family communities heard about the effort and it spread – Pine Ridge had not only 189 activity kits, but also sanitary supplies, 70 comforters and warm blankets, food, clothing, sporting goods, school supplies and robotics equipment. In order to deliver the donations, we needed 3 vehicles and a U-Haul trailer carrying eight Girl Scouts and three moms! After a long drive and an overnight in northern Nebraska, Girl Scout Troop 3010 arrived to Wounded Knee District School and went to work unpacking all of the amazing items donated by Kids First and the local Cultural Care community. Together, they sorted, organized, cleaned, assembled, swept, mopped and (the cherry on the top), handed out boxes of Girl Scout cookies to school staff.